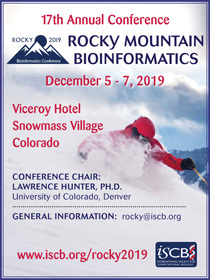 Book Your Hotel Today for ISMB/ECCB 2019! We are pleased to announce that we have two hotels serving as Head Quarters hotels. The Swissotel connected to the Congress Center Basel (CCB) and the Hyperion Hotel (approximately 5 minutes from the CCB). Discounted rates available at both. Don't wait --- book today and lock in this great rate! 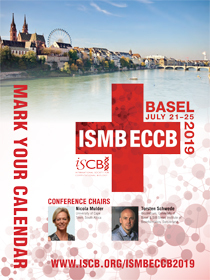 Submit Research to ISMB/ECCB 2019! The call is an open to scientists and professionals working in the fields of bioinformatics and computational biology to submit high quality proposals for Special Sessions & Proceedings. 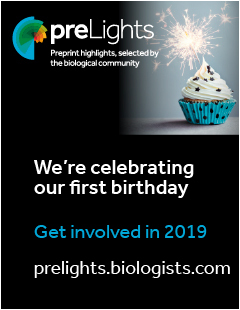 Submit your research today! Funding Opportunity in Translational Medicine and Therapeutics! Deadline: Feb 1st - funding opportunity in Translational Medicine and Therapeutics (TMT) ($60,000 - $100,000/year) The PhRMA Foundation’s mission is to support young scientists in disciplines important to the pharmaceutical industry. 2019 funding opportunities available at postdoctoral and starter grant levels. The goal of the TMT Program is to promote the development and use of experimental and computational methods in an integrative approach towards clinical needs in diagnosis, treatment and prevention. The Foundation believes that to be successful, this requires working with clinicians to identify critical unmet clinical needs. (Applicants must attend U.S. institution. The NIH ENCODE Consortium announces a machine learning challenge to predict the outcome of various types of genomic experiments, measuring diverse properties of the human genome in many cell types. The challenge will be carried out in parallel with ENCODE’s data generation efforts, thereby allowing truly prospective validation. Register at https://www.encodeproject.org/encodeimpute. Call for Technology Track Submissions! 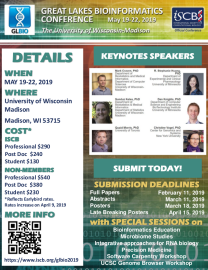 Showcase your new software, technology or hardware relevant to the bioinformatics / molecular biology community at ISMB/ECCB 2019! Submit to the Technology Track today! ISCB SAVE BIG on Journal Subscriptions! Looking for a great holiday gift? Look no further! Check out our title selection today: Bioinformatics - PLOS Computational Biology - ISCB Community Journal by F1000Research. 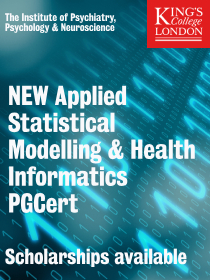 ISCB members receive a discount of 15% per course when they enroll in the online MS in Bioinformatics or MS in Health & Medical Informatics program from Brandeis University. Students prepare to start or advance their informatics careers with state-of-the-art education from expert faculty in a flexible, 100% online format. The senior member designation is attained by members who are one decade post degree and who have demonstrated sustained contributions to the field of computational biology or to ISCB.